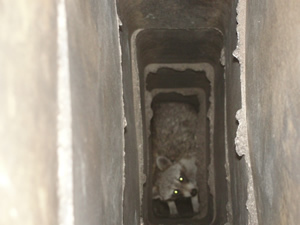 If you ever hear scratching, squeaking, or chirping around your fireplace you may have an animal stuck in your chimney. This is potentially dangerous for you and for the animal if not dealt with quickly. Animals may have nests in your chimney that can quickly alight and cause a fire in your flue. For this reason and the safety of the animal, they must be removed as quickly and humanely as possible. At Black Goose we use care and precision when we are removing animals from your chimney. Keeping pests out of your chimney is as easy as installing a chimney cap. This cover for the top of your chimney is often the first line defense against Raccoons, Squirrels, and Birds. It is also useful in keeping debris out of your flue in fall and spring. Raccoons like to make a home on the smoke shelf in masonry fireplaces. If your chimney is not capped they can easily maneuver into the chimney to have their babies. Raccoons carry rabies, roundworms, fleas and lice. Mama raccoons are very dangerous and must be out of the area before we remove any babies. Mama Raccoon can open most any damper, except for rotary screw type Vestal dampers, and even then she can often still move the damper. Most raccoons can be forced out of the flue, by pushing them with a rod with a half moon tool attached to it. Babies are often too young to climb out on their own and must be physically removed. When our leads remove the babies they will wear heavy gloves so they do not leave their scent on the babies and they will place them in a bucket or box so that Mama Raccoon can come and get them. Squirrels can often be removed by dropping a rope down the flue and securing it to the top of the chimney casing. Sometimes it is necessary to physically remove them. If you have a prefabricated fireplace it is possible for a bird to be stuck in between the pipes. If this is the case the only way for us to remove the bird is to remove the siding of the exterior chimney in order to access the pipe, which will have to be unattached from the top down and then reconnected. The only bird that we cannot remove from a flue is the chimney swift. They are a federally protected species. For more information on chimney swifts please visit www.chimneyswift.org.